I grew up on German Buttercream although I had no idea it was called German Buttercream till few years ago. In Slovakia we call it Pudding Buttercream. 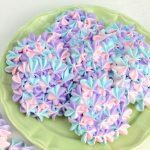 If you are not a fan of heavy, or overly sweet buttercream you really need to try this buttercream. 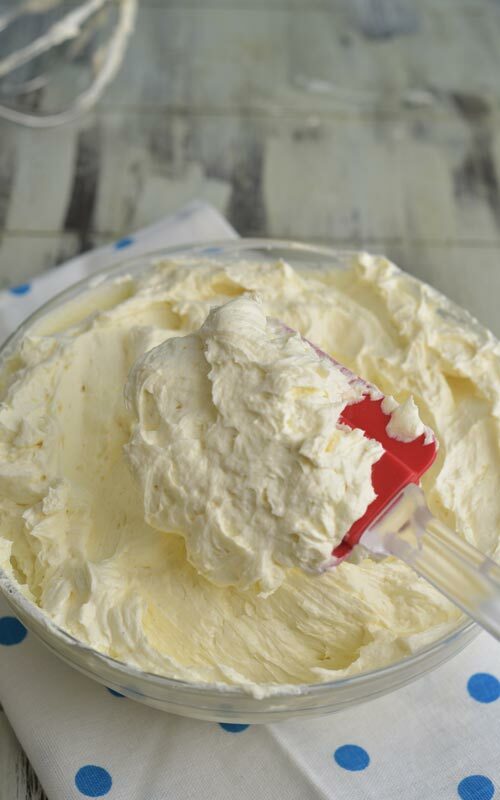 German Buttercream it’s light, silky smooth with a subtle sweetness. You can use it to fill cream puffs, cakes or pastries. I And it also pipes beautifully on cupcakes and cakes. 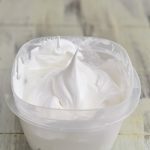 As the pudding buttercream name suggests German Buttercream is a custard / pudding based buttercream. 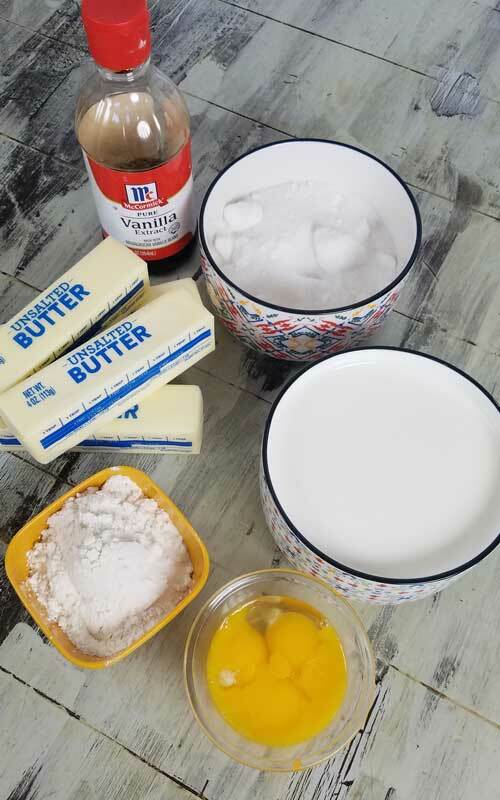 Ingredients you need to make this buttercream are simple : milk, egg yolks, sugar, flour, cornstarch, unsalted butter, vanilla, and pinch of salt. 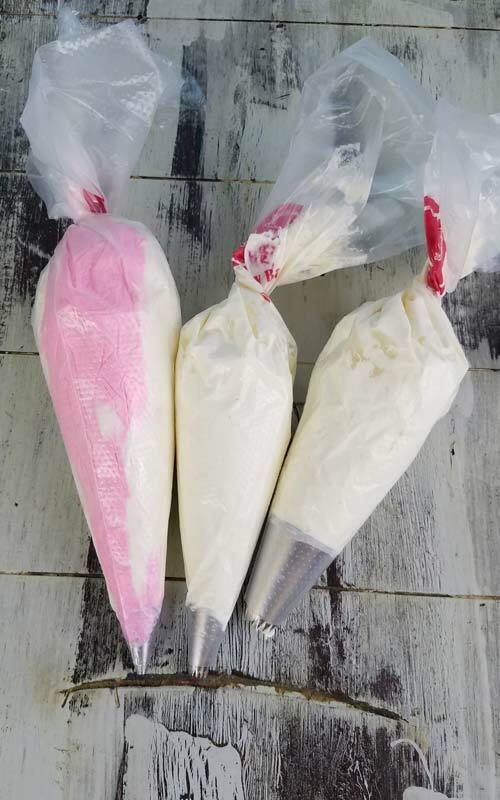 If you like to play with different buttercream flavors try infusing milk. You can try coffee beans, mint, vanilla bean or even lavender. For example, simmer milk with coffee beans for 10 minutes, cover and let it steep for another 10 minutes or so. In the past I’ve made Vanilla, Caramel, Coffee and Chocolate German Buttercream. 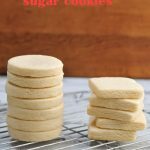 They are all equally delicious and really easy to make. 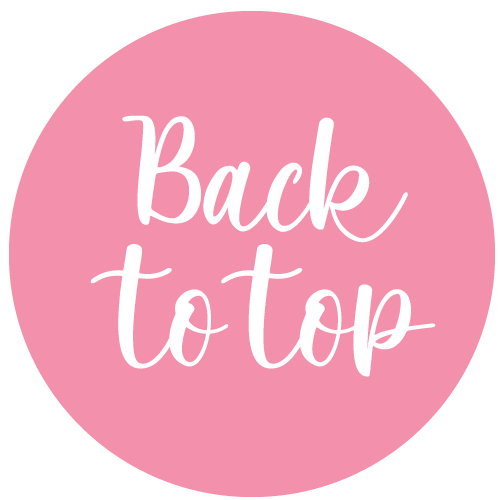 Today I’m going to share my vanilla version. 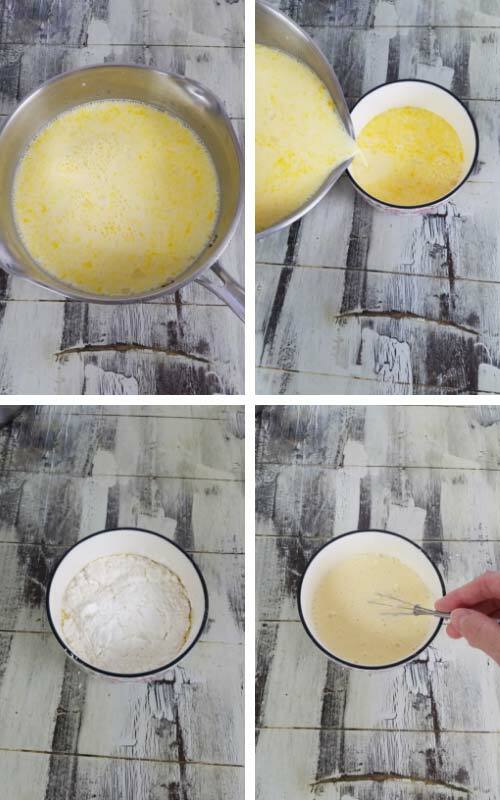 In a sauce pan whisk together milk, sugar and egg yolks. Pour about 1/2 cup of mixture into a smaller dish. Then whisk in all the cornstarch, flour and salt. Whisk well so there are no lumps. Whisk both liquids together and cook on medium heat. Stirring constantly, mixture will gradually thicken. Once it starts to boil reduce the heat and cook for 2-3 minutes. As soon as you take it of the heat pour the custard through a fine mesh sieve. Use a flexible silicone spatula to press it through. Discard the cooked egg bits caught by the sieve. Immediately cover custard with a plastic wrap. Wrap should be touching custard surface. This will prevent skin from forming. Before we can beat custard and butter together, custard has to cool to room temperature. To accelerate the cooling process I use cold water bath. You can also put covered custard into the fridge to cool. Let it cool overnight in the fridge. If there is one thing that I’ve learned over the years of making this buttercream is that butter and custard, both need to be at room temperature. 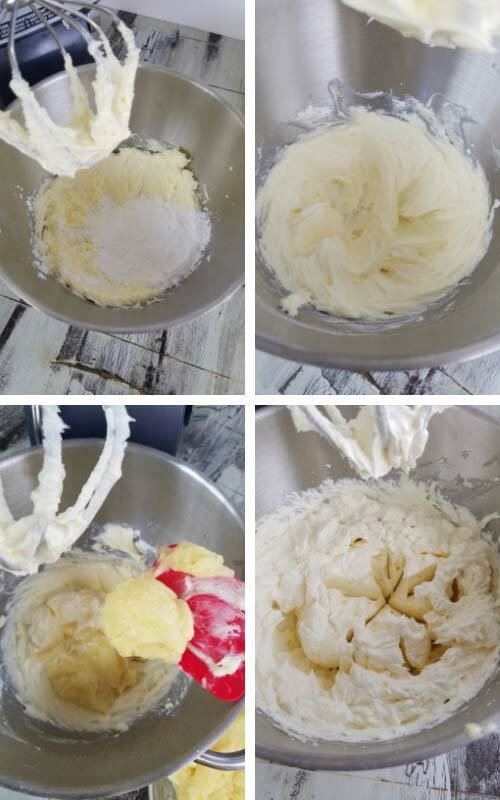 It is a key to a delicately smooth buttercream texture. Cream room temperature unsalted butter with powdered sugar and then gradually add room temperature custard. 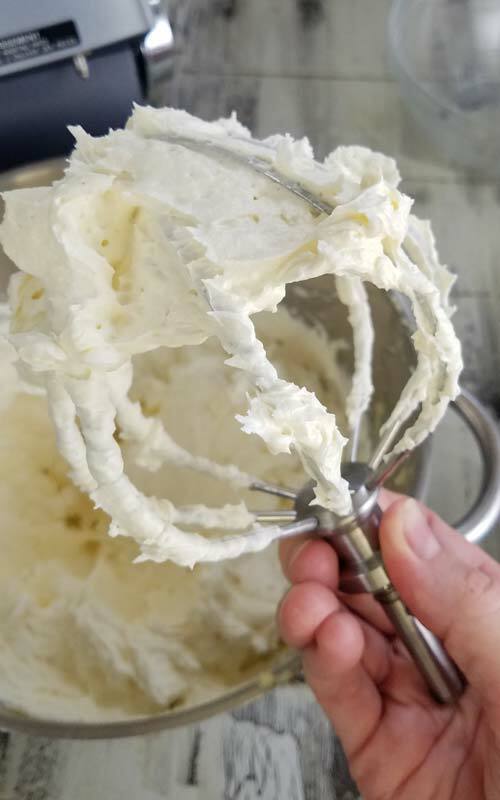 Use a wire beater to mix buttercream. Lastly, I like to add Vanilla Extract and if I have some Vanilla Bean Paste I also add that, too. How do you bring refrigerated custard to room temperature? I usually microwave it on high in 5 second intervals. Stirring gently after each heating, until it’s at room temperature. It doesn’t take that long and it works. It usually takes 10 seconds, make sure to stir halfway, though. CAN YOU FREEZE GERMAN BUTTERCREAM? 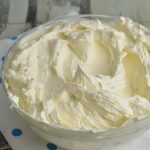 German Buttercream can be made ahead of time. It can be frozen in a freezer safe container for up 3 months. Let it defrost on the counter overnight. Remix and use as desired. It keeps in the fridge for up to 2 weeks. Let it come to room temperature before using. It’s fine to keep it at room temperature for up to 2 days. As I have mentioned before this buttercream pipes beautifully onto cakes. Just like with any other buttercream that contains butter heat will make German Buttercream softer. 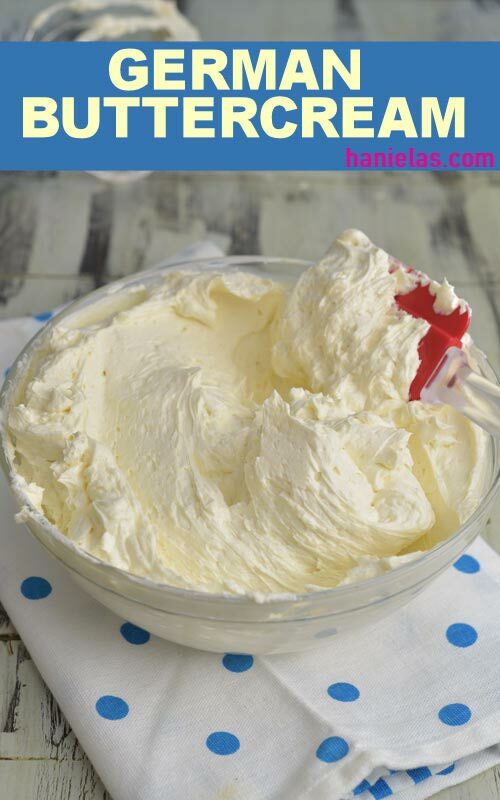 If you notice buttercream is getting softer as you are piping with it place it in the fridge for 5-10 minutes. 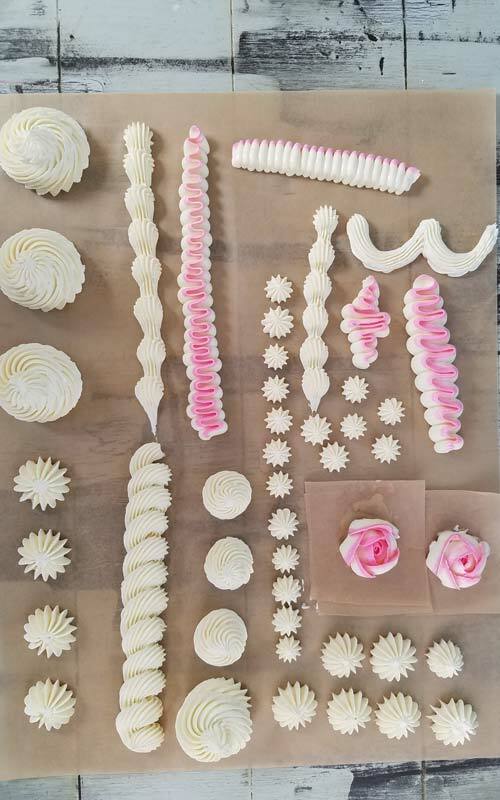 You can color German Buttercream with gel food colors and use wide range of piping tips to create pretty piped designs. German Buttercream can be used to ice the outside of the cake. Though I have to say it is a bit different to work with than Swiss Buttercream. I’d say it is more elastic. Nevertheless it can be done. 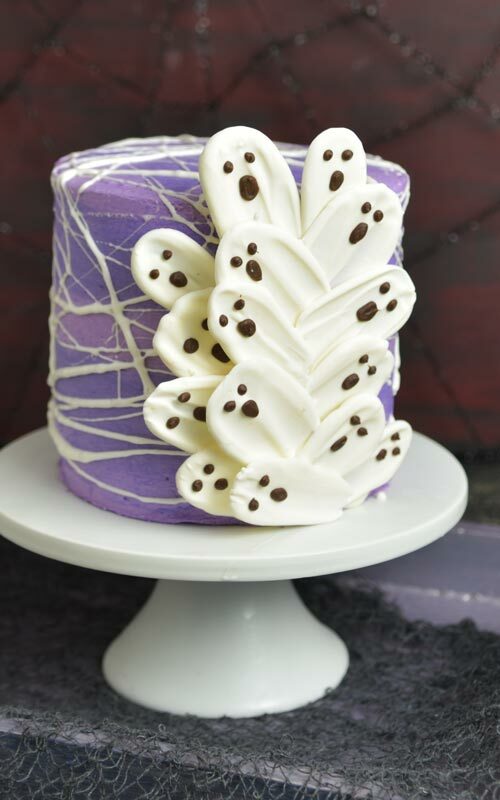 I’ve used it to ice my Brushstroke Ghost Cake few years back. 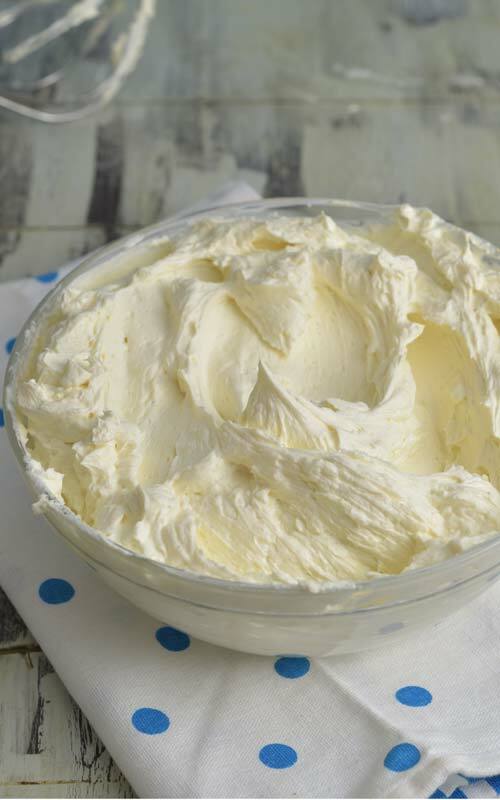 German Buttercream has a creamy color with a yellow tint. Personally it doesn’t bother me. But I know that on occasion you might want a pure white buttercream instead. You can either add White food coloring or if you are brave enough you can add a minuscule amount of Violet or Purple. By minuscule I mean a tip of a toothpick dipped in food coloring. First and foremost, if you are planning on neutralizing yellow with purple test it out on a small portion of buttercream first. Since I don’t have a purple coloring I use sky blue and electric pink instead. You can see my results in the picture above. Notice whiter buttercream in the middle? In a sauce pan whisk together milk, egg and sugar and salt. Pour about 1/2 of this mixture into a dish. Then add starch and flour. Whisk well so there are no lumps. Pour flour/starch mixture into the remaining milk mixture into a sauce pan. Cook on medium heat stirring constantly. Custard will gradually thicken. I find it’s best to use a whisk. Once you see bubble to pop, reduce heat to low and simmer for 2-3 minutes. Remove from the heat and strain through a fine mesh sieve. Cover tightly with a plastic wrap and let cool to room temperature. To speed up cooling you can use a cold water bath. Or if you plan on making buttercream next day you can refrigerate covered custard overnight. 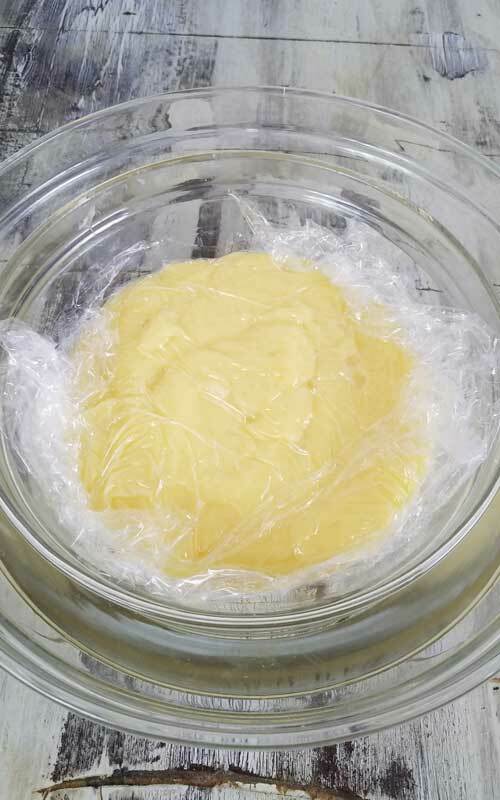 If refrigerating let custard come to room temperature before mixing with butter. I like to microwave it on high in 5 second intervals, stirring gently after each heating. Beat room temperature unsalted butter for 15 seconds. Then add powdered sugar and beat on low until fully incorporated into the butter. Increase the speed to medium and beat for 15 seconds. 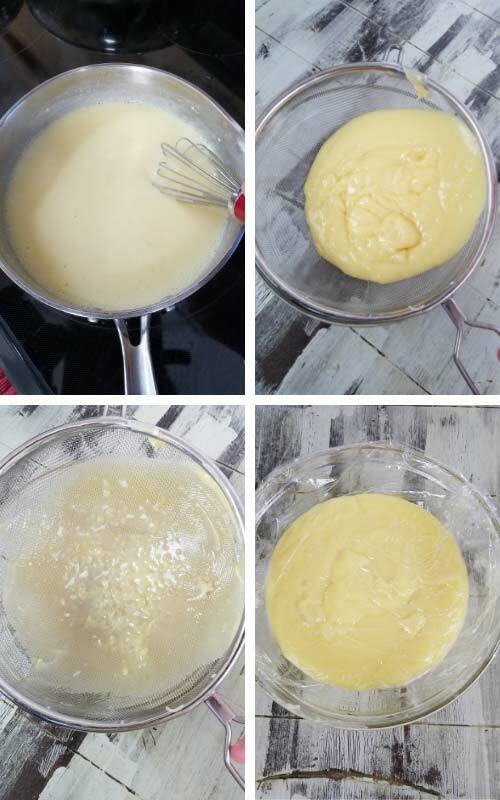 Gradually add room temperature custard to butter, creaming well after each addition. Once fully blended, beat in Vanilla Extract and/or Vanilla Bean Paste. Beat on high for 10 seconds. German buttercream is ready. It’s okay to leave it at room temperature. It’s a fully cooked buttercream. Leave it at room temperature for up to 2 days. Store in the fridge for up to a 10 days. Let it come to room temperature and remix till smooth. Freeze for up to 3 months. Let defrost, and remix before using. Filling for cream puff, cakes. Piped swirls on cupcakes, cakes etc. It pipes beautifully on cakes and cupcakes. If needed you can also ice the cake on the outside with this buttercream. I’ve done this in the past though I find it a bit more elastic than Swiss Buttercream. Can I color German Buttercream? Yes you can color this buttercream. I use gel food colors. I made this for the first time for Easter for a carrot cake. I think this might become my go-to frosting from now on. Thanks for the recipe! That’s awesome! I’ve glad you like it. Happy Easter. Thanks for sharing this recipe, Hani!! I want to make this later this week! We’re having a gender reveal party for our families next weekend and I want to make a cake but use this frosting! Hubby and I are finding out the gender on Wednesday and then we’re using the cake to surprise our families! A couple questions… how would this buttercream work covered in a marshmallow fondant? I want to make a galaxy-colored marble fondant and decorate with pink and blue stars that say “Twinkle twinkle little star, how we wonder what you are.” Also, I don’t have vanilla bean paste but I do have homemade vanilla extract (made with vanilla beans and vodka)… would it work to simmer the vanilla extract in with the custard? I really want to cook out the alcohol since I’m pregnant (even though it’s a minuscule amount lol) but if that won’t work then I can always use imitation I guess! Hi April, congratulations on your pregnancy. Thank you for your wonderful recipe. I am from Czech Republic and I can surely appreciate it. I am not a big fan of american buttercream, so for my cakes I am usually using Swiss or mascarpone/heavy cream fillings. For the chocolate German Buttercream I just need to add cocoa to the custard or butter/sugar mixture? I do have request for yellow cake with chocolate icing and I would like to try German Buttercream. Hello Bohdana, when making Chocolate version I add cocoa powder with flour and starch. Then once the curstard starts to boil/simmer I add chocolate chips or chopped chocolate. You can play with with the ratio. chocolate to cocoa powder. I usually add 1/4 to 1/3 cup good cocoa and then 1/2 to 1 cup chocolate chips.Hope it helps. I have made tons of frostings/icings – but have never tried a German Buttercream. Sounds wonderful. It’s abit more work because of the custard. Is the flavour that much different from a Swiss or Italian Meringue? Thank you for sharing! I think it’s definitely worth the try. With whipped cream it’s my favorite cream puff filling. And I very often make a chocolate version of it which I like even better than vanilla. It’s a rich tasting frosting. Swiss and Italian they kind of dissolve in your mouth and you need another spoon to taste them. I love meringue based ones, too. 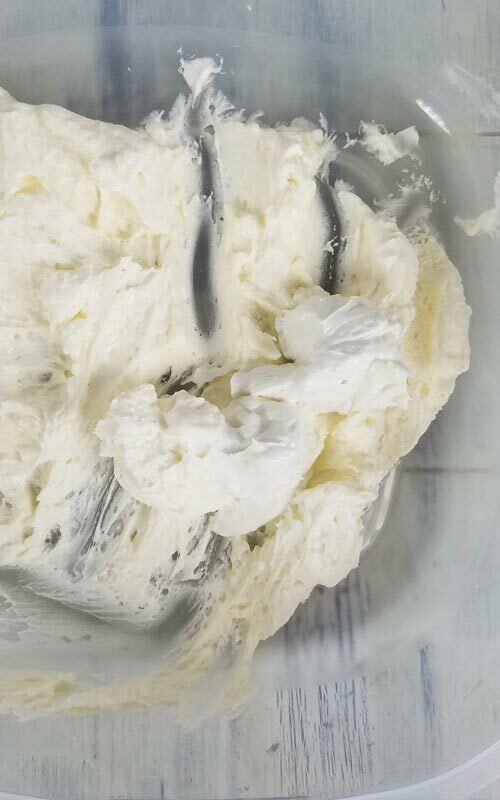 German buttercream has the same silky texture but taste lingers for a little longer. I don’t think it’s ideal under fondant but folks on FB told me they’ve used with no issues. When remixing after defrosting, do you put it back in the mixer or just mix by hand? 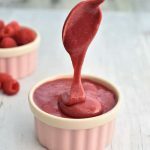 I just use a hand held mixer and quickly remix it in the container I froze it in. This looks FABULOUS! I would like to try it for the cake I’m making for Easter, especially as my grandmother is German and my grandfather is Slovak. Do you think I could flavor it with key lime without curdling it? I was planning to make a coconut cake with key lime curd filling and a light lime buttercream, but having been trying to decide what kind of buttercream to make as an American buttercream seems too heavy. Hi Lorena, that’s so sweet of you to make your grandparents a cake for Easter. I tried to add lemon juice to German buttercream and I left it on the counter overnight and it was fine. I added freshly squeezed and strained lemon juice to buttercream, I didn’t add it to the milk. I added it after I was done beating buttercream. Hope that helps. I like the idea of key lime curd filling and maybe make coconut German Buttercream ? Keep me posted how it goes. Happy Easter. Lick the beaters…. lol!!!! This looks so good. I’m a huge fan of custard, so I will definitely be trying this! Few years back I got a card for my mom saying what a wonderful mom she had been because she always turned off the mixture before letting us lick the beaters. I love custard based desserts, too. Hi Tina, Thank you. I usually add 1/4 to 1/3 cup good cocoa and then 1/2 to 1 cup chocolate chips.Hope it helps. I add cocoa with starch and flour. I cook custard and then when it’s hot I stir in chocolate and simmer for 2-3 minutes like regular custard. You can also add cocoa when you beat sugar and butter.